Science at Sunset features a presentation titled, “Disentangling the language of nature: How mathematics helps us understand the world we live in” by Diogo Bolster, professor of civil & environmental engineering & earth sciences, Frank M. Freimann Collegiate Chair in Hydrology, and associate director of the Environmental Change Initiative for ND-LEEF. With a concerned eye for the impact we have on the earth, Bolster develops simple mathematical models as useful tools for decision making. He has a passion for using math to understand the beautiful world we live in and looks forward to sharing his knowledge on vortex rings, aquatic ecosystems and fluid dynamics with you. Don’t know what these are? Come find out! ND-LEEF will provide food for the free program and attendees are welcome to bring their own beverages, including beer and wine. Other alcoholic drinks and glass containers are prohibited; all beverages must be brought in plastic or metal containers. 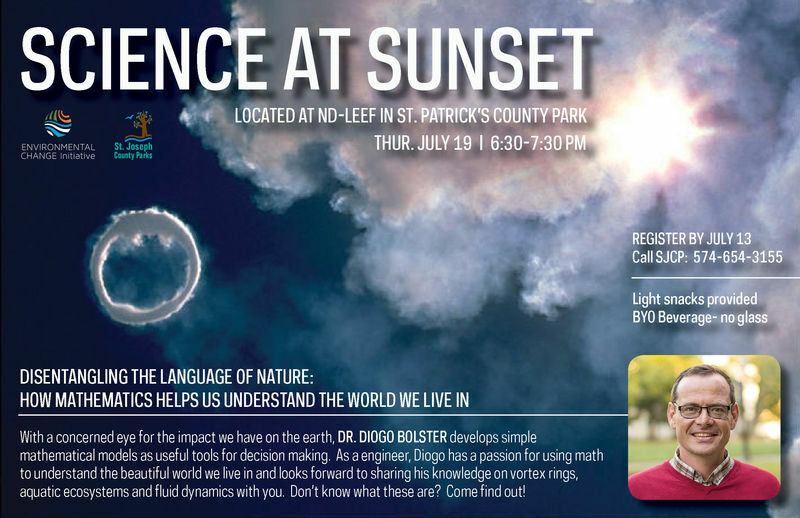 Although the County Parks and ND-LEEF partner on many science-related programs, the “Science at Sunset” series is unique in that it is designed for adults. This event will take place at the ND-LEEF Morrison Family Pavilion within St. Patrick’s County Park located on Laurel Road in South Bend. The program is free, but registration is required by phoning the County Parks’ program reservation line by July 13 at 574-654-3155. Feel free to download and disseminate the event flyer!